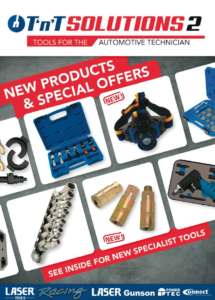 Tech’n’Tools has unveiled a new tools catalogue for automotive technicians and mechanics. The latest 12 page catalogue featuring new products a special offers is now available from Motor Factors and Tech’n’Tools stockists nationwide. The catalogue complements TnT’s other brochures: such as “Welding and Air Solutions” and “Diagnostics and Test Equipment”. All publications can be downloaded from www.techntools.ie or are available from your local TnT stockist. The centre pages feature a handy poster highlighting Air Supply products from the Connect range, page 2 and 3 feature diesel related products, LAS5205 for removal of damaged glow plugs proving very popular. Great new lighting products featuring a Twin Head Worklamp (LAS7058) which can be used for leak detection and Alldrive sockets are must have for any garage.